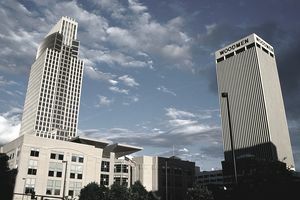 The First National Bank of Omaha (sometimes just called First National Bank) offers a several credit cards, and one of them is a simple cashback credit card through American Express. While it's not a leader in the world of rewards credit cards, the First National Bank American Express Card has plenty of perks to offer at no cost to the cardholder—unless you're carrying a balance. This card does not have an introductory purchase offer, and the issuer does not specify the credit score needed to qualify. You get an automatic $100 statement credit if you spend $500 during the first three billing cycles your account is open. Keep in mind you need to register your card for rewards, so if you want as much time as possible to meet that $500 spend threshold, remember to enroll your card ASAP. The credit can take six to eight weeks to appear on your statement. A $100 bonus after spending $500 is decent, but it's not the best out there. There are cards with comparable rewards that offer a higher sign-up bonus for the same spend. The flat-rate rewards makes it easy to rack up cash back—just remember to register your card for the program. You earn an unlimited 1.5 points per $1, or 1.5% cash back, and while that's not the best flat rewards rate available, 1.5% is on par with competitors. Cash back doesn't expire, but you will lose any unredeemed rewards at the time you or the issuer close your account. When you accumulate 2,500 points ($1,667 of purchases), you receive an automatic $25 statement credit within five business days. You must still make the monthly minimum payment on your statement, even if your statement credit exceeds the payment requirement. The flat rates for earning and redeeming rewards makes it easy to get the most out of the First National Bank American Express Card. But if you ever want to close the account, you'll want to wait till you have 2,500 points and have received your statement credit, so you don't let points go to waste. Many of the added benefits on this card require registering the card with American Express. Make a note to do that if you get this card. Free FICO Score: First National Bank of Omaha gives its credit card customers free access to their FICO scores. The score updates monthly, and new cardholders generally see their score within 45 days of account opening. Fraud Protection: As is standard with most credit cards, the First National Bank American Express Card offers 24/7 account monitoring and will alert you to suspected fraudulent activity. Zero Liability: This is another standard feature that ensures cardholders aren't liable for fraudulent charges on their accounts. American Express Connect: Cardholders enrolled in benefits can access discount offers in a variety of areas, including dining, entertainment, sporting events, shopping, and more. Auto Rental Insurance: At no additional cost, you're eligible for up to $50,000 to replace or repair a rented vehicle damaged in a collision. You must use your card to pay the entire car rental fee and decline the rental agency's collision damage liability waiver. The insurance can serve as secondary or primary, and exclusions apply. Travel Accident Insurance: For no additional cost, you qualify for up to $250,000 in travel accident coverage for accidental death or dismemberment when you book the full travel fare on your card. Exclusions apply. Travel and Emergency Assistance: If you encounter an emergency while traveling, you can call a 24-hour line where a benefits administrator will refer you to the assistance you need. The referral service is free, but any assistance you use will likely carry fees. Purchase Protection: This benefit covers most things you pay for in full with the card. For 90 days from the date of purchase, you can get up to $1,000 per incident ($50,000 lifetime limit) for covered theft, fire or accidental damage. Extended Warranty: This benefit extends an item's original manufacturer's warranty by up to 12 additional months on almost anything you pay for in full with the card. This card does not have a penalty APR or an overlimit fee. The First National Bank American Express Card is fine, low-maintenance pick for simple rewards. After you enroll your card in American Express benefits, the rewards take care of themselves, but if you're OK with taking an active role in redeeming rewards, you can get better value elsewhere. This card has the best flat rewards rate of any credit cards through the First National Bank of Omaha, but there is another rewards card, as well as a card with introductory purchase and balance transfer offers. The other cards are on the Visa network. You can learn more about and apply for the First National Bank American Express Card on the bank's website. To compare it to similar products, check out our list of the best money-back credit cards.